During this week’s podcast, we had the privilege of talking with Robert Reiss, author of “The Transformative CEO”. Robert has interviewed over 250 of the world’s top CEOs. His new book shares the techniques top CEOs use to transform companies, reinvent industries, and reboot societies. 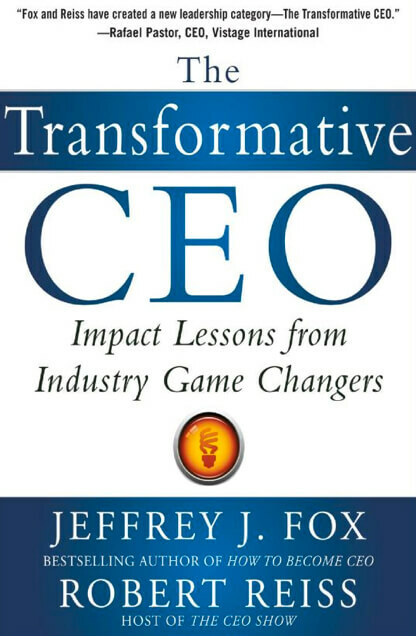 This is a must read, must own book for every CEO or business owner. Robert than explained 5 ways top CEOs transform their companies. 1. Have a higher purpose: The top CEOs focus on the higher purpose of why they are in business and it’s not just about making money. Then the top CEOS make sure every person in the company understands the higher purpose. 2. Embrace challenges/obstacles: Top CEOs embrace every challenge/obstacle as an opportunity. They know that every obstacle will help their company grow and become strong. 3. Focus on the culture: Before they focus on the customer, the top CEOs focus on the culture. If the culture is strong than employees are happy, creative, and innovative. Happy employees mean happy customers. 4. Learn from other industries: Many times other industries have already solved challenges you may be facing. Top CEOs spend time learning from other industries. 5. Make the best product: Make a product or service people tell friends about. Don’t cut corners. Build the best product and experience. It will save you tons of money in the long run. The rest of the interview with Robert Reiss was inspiring. After reading “The Transformative CEO”, I highly recommend it. It is like sitting down face to face with the top CEOs. The knowledge and insights are priceless. Robert Reiss hosts a nationally syndicated weekly radio show called The CEO Radio Show. You can listen to Robert’s latest CEO interview here. The book is also co-authored by Jeffery J. Fox. You can also buy the book here on Amazon. Burke is passionate about strengthening America through small business and entrepreneurial growth. He has spent over 20 years in the pursuit of learning, developing, and executing principles and strategies that drive high-performance and explosive business growth. Burke writes about business financing, leadership, marketing, teamwork, and productivity. You can follow Burke on twitter here. Robert has one of the coolest jobs in the world. The stories he has talking to the CEOs of small and large companies is inspirational and full of real world insight.